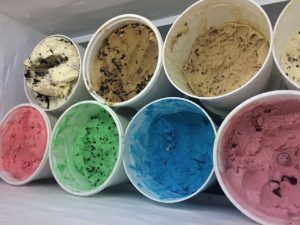 Turkeyville is proud to offer our homemade ice cream with fresh, locally sourced, all natural ingredients, available in 16 delicious flavors. All sizes maybe placed in a dish, regular cone or sugar cone. Turtle Sundae: Two dips of vanilla ice cream with hot fudge, hot caramel pecans, whipped cream and a cherry. 13 dips of ice cream of your choice, 5 toppings of your choice, crushed peanuts, whipped cream and a cherry If you can eat it in 15 minutes or less…… it is free! !